This is the t-shirt I wore to do my 10 mile Great South Run challenge. 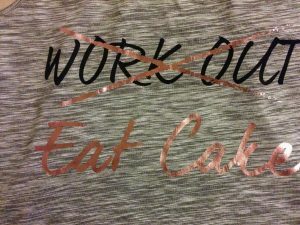 I had planned on buying a new t-shirt but as this was my favourite exercise t-shirt, I decided not to change it. 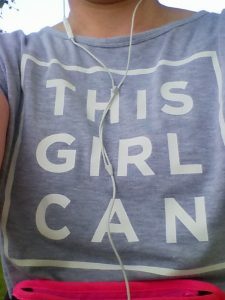 I actually bought two of the t-shirts from Marks and Spencer’s when they were reduced in price (and even then they were not cheap!). They were part of a campaign to get more women active. I didn’t know much about it but liked the words and thought it suited me. I was somewhat surprised, shocked,dismayed and all sorts of other things to read a recent article on the BBC news site that the campaign returns. Okay, nothing shocking with that I know but what I hadn’t realised is the previous campaign was aimed at females between 14-40 to start, or restart a sporting activity. Now the campaign was widening the age to include women in their 50 and 60s. It came as quite a shock to realise that I was in that age bracket! At the age of 50, I am quite active. I am lucky to be able to walk to work, weather dependant, as it is only 2 miles away. I will often exercise to a DVD, go to Zumba and try to run 5k once a week (okay not so good in January). I have also been a bit obsessed with my Fitbit challenges and aim to win them. Having a bit of a rest this week as exhausted! I can relate to this but there are ways to overcome it. My Zumba class instructor, Lana, was a dancer and is very fit. I went along with my friend, Karen to her dance class in the beginning and it has always attracted a very mixed age group. Karen and I had tried lots of exercise classes but this is the longest we have stuck to it. Dancing doesn’t come naturally to me but the classes were fun and we both have made some great friends. When Lana became pregnant, she gave up the dance class but carried on with the very popular Zumba classes so we joined that. Again not natural at moving my bottom and stuff but it is fun. Even after 5 years, I will still opt to hide and dread it if Lana comes over to advise on a movement even though she will be helping. I think it is a fear of being looked at but really I should reap the benefits of knowledge and not be so self-conscious. I have heard people say that they can’t go to a class because they will be bigger than everyone else, that everyone will be slinky in Lycra and, if they go, they can’t get the moves. There are all sizes in our class and it doesn’t matter if you are big or slender, you can still move and have fun. We wear legging from Asda and any sort of t-shirt. Slogans are my favourite. As for the dance moves, if I can get there (it has taken me a long time) anyone can. If you are a newbie, you have to give yourself a chance. I have a challenge to take up swimming on some level. Now I learnt how to swim at around 9 with Karen. She won’t mind me sharing this information with you but we both swim like meerkats. We don’t like being out of our depth and certainly don’t like being splashed. I have been trying to pluck up the courage to go to our local swimming pool. After doing some research, I have found a local private pool where I can go to using the pool on my own or with friends. Even the reviews are by people with the same fears as me so it has to be tried. It will be more expensive than the local swimming pool but I am willing to pay. I think this will be a This Girl Can moment! 2 Keeping participants from giving up sport. This is a tough one. Since January I have been doing Hip Hop Abs DVD six days a week. The last couple of days I haven’t had the energy and I think that I have put myself through too much. I also stopped enjoying it. What you have to do is find something you enjoy doing, make time for it (don’t feel guilty for doing it – the right exercise and programme does really make you happy and fitter) and, if you feel happier doing it with someone else, find the right person so you can both encourage each other. It is difficult to find the enthusiasm to keep going sometimes especially if you are tired and it is dark and cold. Karen and I would go to Zumba twice a week. We used to text each other in the morning and ask if the other was okay for Zumba. They don’t sound negative words but what they really mean is if you are don’t want to, I will breathe a sigh of relief and eat chocolate whilst sat in my pyjamas watching the soaps. Last year, I became more positive with my texts. They would read “I will see you tonight for Zumba”. If Karen said she wasn’t able to go, I could have the chocolate without the guilt! We are actually both comfortable to go to the class on our own really. As Karen has a course to do on one of our normal days, we tend to only go one of the nights. Due to me feeling exhausted from walking and the DVDs, I have gone back to my first line of questions but I am pleased to say I have been once a week since the beginning of January. See, we girls can! I have just cringed again; this is me. I have the t-shirt, I wear it often and I can do it so anyone can do it. I know lots of lovely ladies in this age group who do it. They come to Zumba and are so fit. I regularly see ladies walking or running in this age group. I do think there are a lot of my age group who are taking part in regular exercise although I think that if a few more are encouraged by this campaign then it will be a huge benefit. The site has some great ideas on so go on there and find something. Karen wants us to give archery a go!